Location: Thégra, in the Meurthe-et-Moselle departement of France (Lorraine Region). Ownership / Access: Adhémar de Valon, Lord of Thegra. Notes: The castle of Thégra is a castle located in Thégra, France.The Viscounts of Turenne were the suzerains of Thegra, but this suzerainty was contested by the lords of Cazillac. However, a decree of the parliament of Bordeaux of 1526 confirmed that the Vicomte de Turenne was the suzerain lord of Thegra. This decision was renewed in 1705 and 1735. This dispute on the boundary between the Turenne and Cazillac vicuories did not make it possible to demand the homage of the lords of Thegra, making it appear that the seigneury of Thegra was a franc alleu. To escape this suzerainty, the lords of Thegra declared themselves vassals of the only count of Toulouse, then of the king. However, since the Viscounts of Turenne had bought the barony of Cazillac on 3 March 1689, this challenge was no longer necessary. A bull of Pope Pascal II dated April 4, 1106, the possession of the revenues of the Church of St. Bartholomew of Thegra, seat of an archpriest, established in the time of St. Didier, Bishop of Cahors, in the chapter of Cahors. The Archpriest of Thegra was very large and included more than 60 parishes including Rocamadour. In the twelfth century, the seigniory, with all the justice, passed from the viscounts of Turenne to the family Gasc by alliance. One of the members of Gascogne's Gascogne family came to Haut-Quercy following an alliance with the Viscounts of Turenne who would have given him Bétaille and Thégra. Guillaume I Gasc lived in 1120. He had five sons, including Bertrand I Gasc and William II Gasc, then Guillaume III Gasc who donated to the abbey of Obazine in 1181, then his son and heir Bertrand II Gasc. The twelfth century saw the development of the pilgrimage of Rocamadour during the abbey of Ebles de Turenne. Rocamadour being part of the archpriest of Thegra, Ebles de Turenne asked the Gasc who are his parents to ensure the protection of the site. Bertrand II Gasc, lord of Bétaille and Thégra, was guarantor in 1221 of an agreement between Raymond IV de Turenne and Matfred de Castelnau. His daughter married Arnaud Stephani, lord of Gigouzac, around 1215. His son Bertrand III Gasc succeeded him. The children of Bertrand III are Raymond Gasc, the eldest, Guillaume Gasc, Hugues Gasc and N. Gasc married to Guillaume Robert of Cavaignac. Raymond Gasc sold his share of Thegra before 1280 to Raymond de Cornil, bishop of Cahors who yielded it in 1283 to his nephew, Géraud de Cornil. 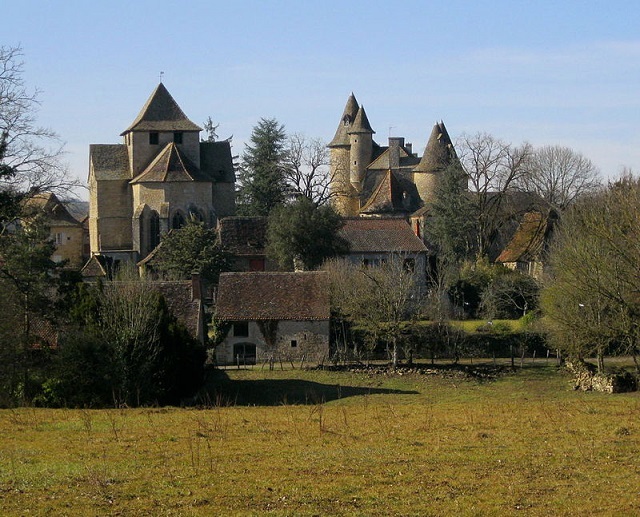 After 1285, Raymond Gasc made Stephani de Valon his heirs. His brothers Guillaume and Hugues Gasc also make the Stephani of Valon their heirs.